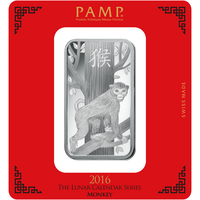 PAMP Suisse Lunar Minted silver Bars are dedicated to one of the most celebrated holidays of the year. 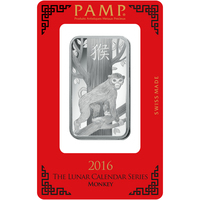 Join the celebration and purchase a Lunar Calendar ingot! The Lunar New Year is one of the most popular holidays in Asia. It is most widely celebrated in China, as well as within the Chinese diaspora all around the world. Due to the intense popularity of this holiday, the Lunar ingots are designed every year in its honor. 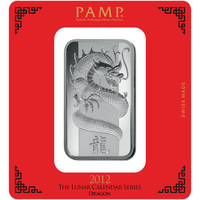 They are one of the only ingots that change their design annually to match the symbolic animal for Chinese New Year. This makes these ingots one of the most unique collector's items. Investors are also keen to take this opportunity and chose to invest in one of the most widely celebrated holidays around the world. 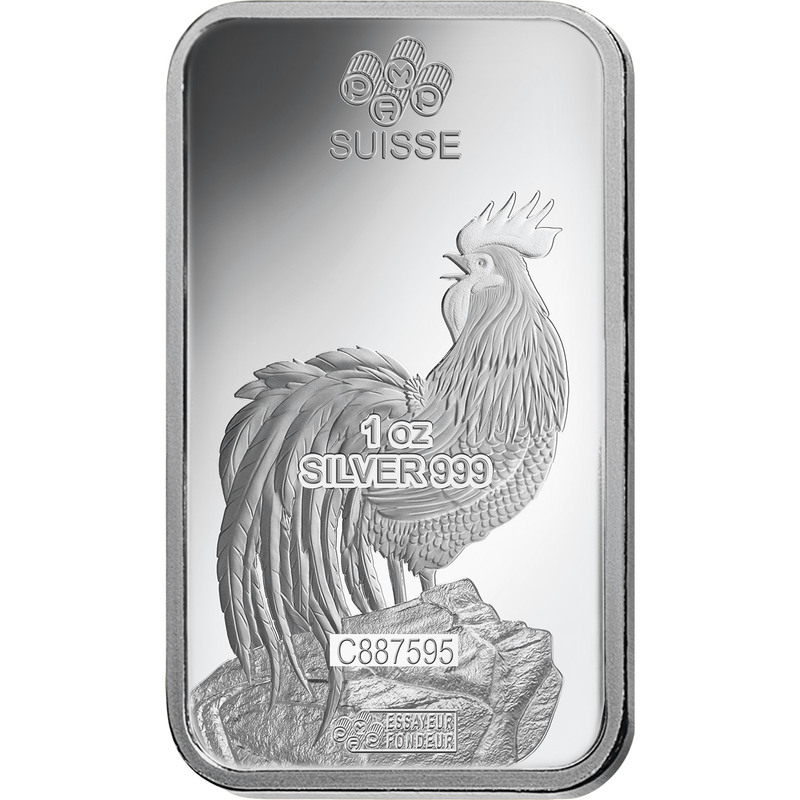 They contain .999 of fine silver and are considered one of the wisest investment opportunities on the market. 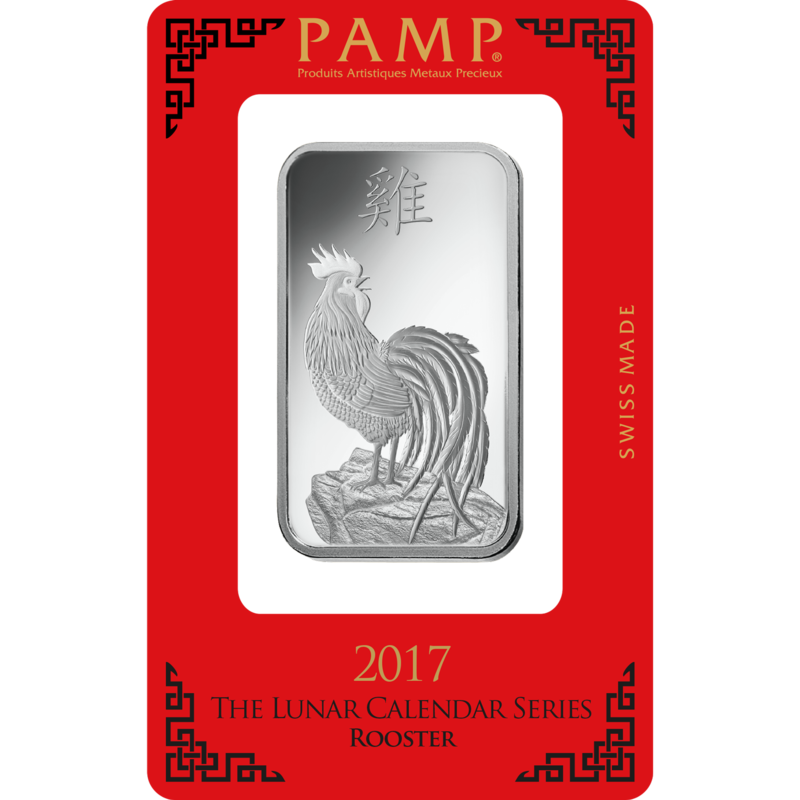 The 1 oz standard rectangular ingot is stamped with one of the twelve traditional animals of the Lunar New Year - the gallant Rooster. The Rooster is shown standing proudly with his chest puffed and his head placed high. He feels dignified of his position in the Lunar New Year. Just as his character traits define him - he appears courageous and bold. 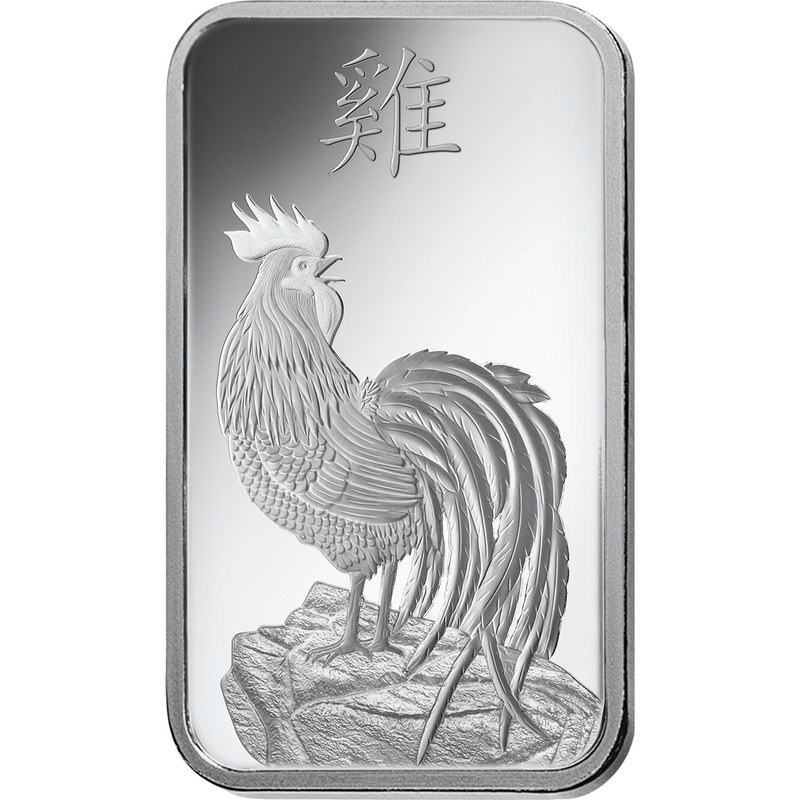 On the reverse side of the coin, we can see the identical image of the Rooster, however, displayed from the back. Additional information on the ingot includes the ingot purity, weight, date of production, as well as a unique serial number. At Gold Avenue, we recommend you take care of your PAMP Suisse ingots. You can do this by using protective gloves when handling your ingots. This will not only protect your investment against scratches but also against any accidents. 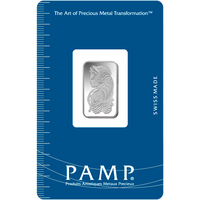 You can also store your ingots in a PAMP safe for extra security. Last year's Lunar New Year was nobly represented by the Rooster, who represents those born in 1945, 1957, 1981, 2005 and 2017. According to the Chinese traditions, people born under these animals receive particular qualities. It is said that those born in the Year of the Rooster are considered hard-working, resourceful and courageous. There are many famous Chinese myths about the origin of the Chinese Lunar New Year and these symbolic animals. The most famous Chinese myth describes the story of the Jade Emperor and his Royal Celebration. The Jade Emperor told the animals that he would decide on their order based on which animal would get to his celebration first. All the animals began their race, however, the final three: the Monkey, the Dog, and the Rooster were currently outside of the Empire fighting evil spirits to restore peace in the Kingdom. Although they arrived late and should have been eliminated, the Emperor was impressed with their courageous deed and honored the animals with the final three positions. The most famous Chinese myth describes the story of the Jade Emperor and his Royal Celebration. The Jade Emperor told the animals that he would decide on their order based on which animal would get to his celebration first. All the animals began their race, however, the final three: the Monkey, the Dog and the Rooster were currently outside of the Empire fighting evil spirits to restore peace in the Kingdom. Although they arrived late and should have been eliminated, the Emperor was impressed with their courageous deed and honored the animals with the final three positions.